Ah, credit card interchange fees. One of my favorite subjects. Here’s how they work: every time you buy something with plastic the merchant pays a 2-3% fee to the credit card company. You never see this fee, though, because merchants are contractually forbidden from charging you an extra 2-3% for credit card purchases. Instead, they just add it to the price of their products and pass it along to everyone, including customers who pay by cash or check. The whole process is invisible. Merchants are unhappy about this arrangement. But generally speaking, what they’re unhappy about isn’t the invisibility. They’re unhappy about the size of the interchange fee, which they’d like to be lower. Now, it’s obvious why merchants and banks fight over the size of the fee. A big fee is good for banks and a small fee is good for merchants. But they both seem to be fine with the invisibility of the fee. Why? Again, it’s pretty obvious: If fees were tacked onto credit card purchases, people would use their credit cards less. That’s bad for banks. But if they used their credit cards less, it probably also means they’d spend less, period. That’s bad for merchants. It’s better for both parties to keep the fees invisible and keep everyone spending lots of money. But retailers may have a tough time convincing Congress that consumers would benefit if the effective interchange rate, which has increased slightly in recent years, is dialed back. 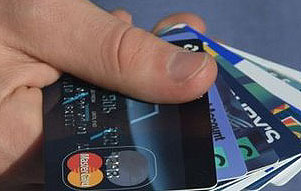 Many other countries, including Israel and Australia, have required banks that issue cards to reduce the fee. Yet there is little evidence that the savings were passed along. In Australia, where regulators required banks to cut the interchange rate for Visa and MasterCard purchases to 0.5 percent from 0.95 percent, the banks offset their loss by reducing rewards programs and raising annual fees, according to a 2008 report by the Government Accountability Office. So what’s wrong with that? In fact, I’d go further: let’s kill two birds with one stone and just abolish interchange fees altogether. Card companies would then be forced to charge higher annual fees to credit card users — fees that (a) would fall solely on the people actually using credit cards and (b) would make it obvious just how much credit cards actually cost. That strikes me as an excellent idea. Credit cards aren’t a free lunch, and there’s no reason that consumers should be fooled into thinking they are. And if that means consumers end up using credit cards less — well, what’s wrong with that? It’s the free market in action.